There is groundbreaking news for this year in the realm of color analysis. The old techniques are becoming irrelevant as new and groundbreaking ideas emerge. ByFERIAL Image Consultant firm has spent many years developing new ways to approach color analyses and the research has finally paid off. Conventional color analysis is based on the four seasons/groups. Autumn (warm & deep) is dark and fiery, winter (cool & Deep) has dark and light colors in sharp contrast, and spring (warm & light) represents growth and has vibrant colors while summer (cool & light) has cool and soft calm colors that reflect full life. 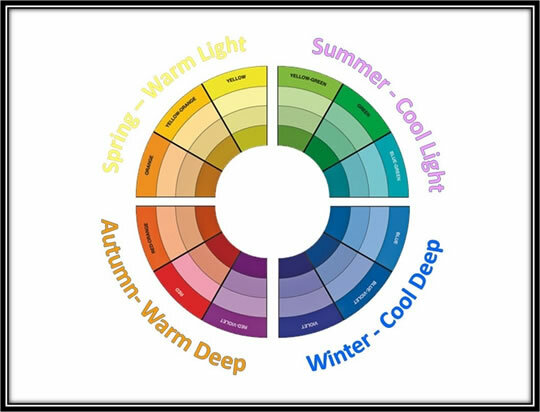 This idea has been the foundation for color theory for many years, leading to various fashion, makeup and effects based around the seasons/groups. That is until we realized there is a gray area. While ByFERIAL researched new ideas that departed from the Four Season concept, a new gray area started to show. The four seasons didn’t represent every color available, calling in to question various techniques used throughout the years. Delving back in to history, the researchers at ByFERIAL read various types of color theory throughout the ages. Studying the Munsell system, this gray area could no longer be ignored. Munsell based his theory of color on hue, lightness, and color purity. Reacquainting ourselves with this system has helped break through the old four season thinking. The new breakthrough is the 4X4 Color Analysis system. This unique system caters to all skin types. The foundation of the four seasons is kept, but each season has four separate categories. As we know, summer tends towards colors that are cool light but soft, representing nature in the prime of life. The categories for summer are Pure Summer, Tinted Summer, Toned Summer, and Shaded Summer. Each category is fine-tuned to represent a range of colors and helps with a variety of skin tones. Pure summer is the cool and brightest colors of summer, representing the growth of life. Tinted summer holds the lightest hues, harkening back to the sky on a cloudless day. Toned summer is in the medium range, representing the soil and the bark of trees. Shaded summer is the deepest colors, representing the earth and the life that lives on it. These categories are spread through the rest of the four seasons, leading to a new ways to use fashion and make up. Try our new 4X4 color analysis out by booking with ByFERIAL certified 4X4 consultant today. 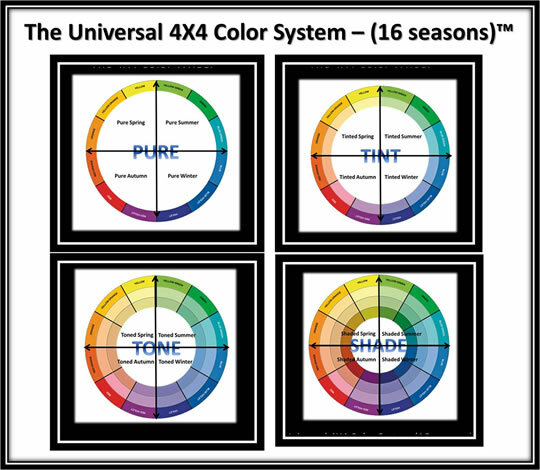 To become an Accredited & Certified Color Consultant in The Universal 4X4 Color System – (16 seasons)™ please feel free to contact us today info@byferial.com. ByFERIAL 4X4 Certified Advance Training is offered to all image, style, fashion or beauty consultants who have been trained and would like to use the new 4X4 innovative system. This training is offered for a great introductory price and is conducted once a month online (3 hours) and can be taken at anytime in the comfort of your own home. The 4X4 Color System is making a BUZZ internationally. Here is what some color consultants are saying. Like you, I saw the “missing” especially in this country. Your stellar work on colour needs to be known around the world. I do my best here, my conversations with clients about colour, goes from Newton, Munsell to Ferial! I guess your book is needed on the shelves right now.